These are lyrics by Taking Back Sunday that we think are kind of repetitive. Taking Back Sunday's, "...Slowdance On the Inside"
Tonight won't make a difference. 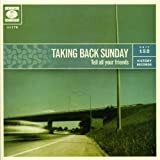 Taking Back Sunday's, "There's No "I" In Team"
Best friends means I pulled the trigger! Best friends means you get what you deserve! I love this line to death, but does it really need to be said six times in a row? Taking Back Sunday's, "You're So Last Summer"
I didn't count how many times it says it, but it says it a lot.